From the Hancock County Courthouse, go west on Hwy 22 for 0.2 mile. Turn right on Dixie Road. Go 1 mile. Turn left on Lake Shore Road (old Pumping Station Road) and proceed 7.8 miles to the "T" intersection with Warren Chapel Road. (Note: this "T" intersection with Pumping Station/Lake Shore Road has Warren Chapel Road to the left and Harper Cemetery Road / Rives Rd. / Crestline Dr. to the right). Turn right on old Harper Cemetery Road and go approximately 3.2 miles. Turn left on Lake Crest (Lakecrest) Drive and go for 0.8 mile to a stop sign. Turn left (still Lake Crest Drive) and go for 1.8 miles. Lot #74 and mailbox #953 should be on your right. The cemetery is on the left side of the road about 200 feet from the road. Many sunken graves that are covered by leaves. 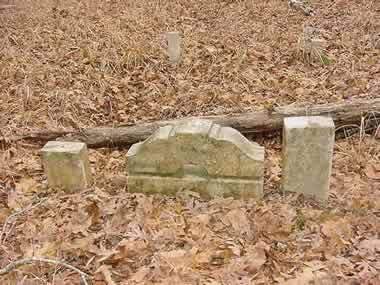 Some have rocks as headstones.